The award-winning Dancing Rabbit Golf Club is the crown jewel of Pearl River Resort, and the masterpiece of renowned designers, Tom Fazio, and PGA great, Jerry Pate. Featuring two championship golf courses, The Azaleas and The Oaks, Dancing Rabbit is consistently listed among Golf® Magazine's "Top 100 Courses You Can Play," Golfweek Magazine's "Best Resort Courses," and Golf Digest's "America's 100 Greatest Courses." 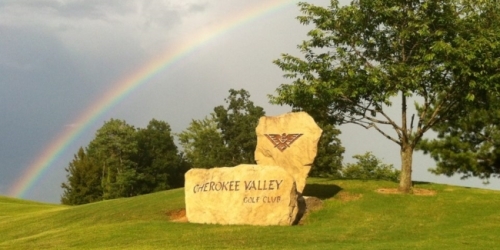 Nestled among gently rolling hills, Cherokee Valley Golf Club extends a challenging game to golfers of all skill levels. Eleven lakes and 52 bunkers may seem to intimidate, but wide fairways and clean roughs are very forgiving. The 18 hole par 72 course ranges from 6751 yards at the rear tees to 4422 at the forward tees. A state of the art practice facility includes a three tiered driving range, 2 putting greens and a chipping green. The lodge-style clubhouse features spectacular views of 9 and 18 greens from both the snack bar and the banquet hall. This Memphis area golf course serves as an attraction for players and tourists coming from different parts of the country. Experience a great and comfortable ambiance for golf play and relaxation any time of the year. The mild four season weather conditions also makes Cherokee Valley one of the highly recommended golf courses in Memphis' surrounding area which guarantees to cater to all your golf gaming needs. Mossy Oak Golf Club is set in the rolling hills of the Mississippi Black Prairie and features a 7,500 yard, par-72 course designed by renowned architect Gil Hanse. The course routing is a walk through dotted native oak trees and grasses, with interesting elevation changes and expansive views. Shaped with attention to minimalist design, the course is ideal for walking with tee boxes placed adjacent to the greens. The natural habitat guides the golf experience with many 360-degree views of the entire property among the 18-holes. The Bridges Golf Club at Hollywood Casino is Mississippi's only Arnold Palmer Signature golf course and is an 18-hole, par 72 jewel among lakes and wetlands. Originally opened in 1997 and renovated after Hurricane Katrina, The Bridges was named for the 21 wooden bridges than span almost a mile over 17 lakes and 14 acres of marsh, wetlands and fairways. It is the only casino resort golf course on the Mississippi Gulf Coast with a hotel, casino and golf course all on-site and in same location. 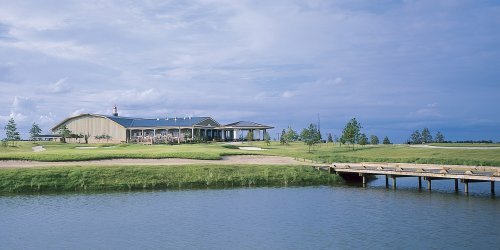 The Bridges is ranked among the Top 50 Casino Courses and One of the Top Courses in Mississippi You Can Play GolfWeek. It was also the first golf course in the world to receive Audubon International Silver Signature Status. Located in Bay St. Louis, one of the "Top Coolest Small Towns in America 2013" by Budget Travel. Featuring over 300 holes of historic championship and coastal golf, the distinctive Mississippi Gulf Coast offers an array of options for all golfers and their families. Donald Ross, Tom Bendelow and Jack Daray - architect of Olympia Fields in Chicago, designed courses here early in the last century. Recently, Jack Nicklaus, Arnold Palmer, Jerry Pate and Davis Love III all built their best here as well. Golfers have been visiting the Mississippi Gulf Coast for great golf vacation packages since 1908, and we look forward to welcoming golfers the next 100 years for golf and casino packages. Our golf vacation package specialists will make your golf trip worry free. At Southern Golf Tours we handle all advanced golf reservations, guaranteed tee times, lodging accommodations with no surcharges or surprise fees! We also offer golf event planning, corporate golf outings and golf tournament organization. For more information, call 833-271-5050. Your golf group will surely enjoy our full-service country club facility with two top-rated golf courses and some of the best greens along the Mississippi Gulf Coast, as well as the only indoor/outdoor Golf Academy. A five-year renovation plan for both of Diamondhead Country Club's championship golf courses was completed in 2016. While all major course routing remained intact, many features were added that place our property on golfer's list of favorite places to play when on the MS Gulf Coast. 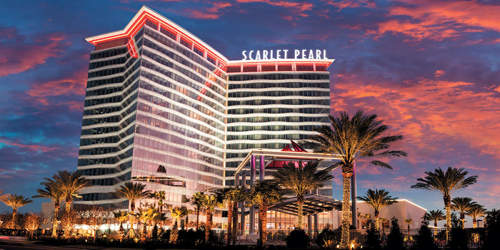 With your Scarlet Pearl Casino Resort Golf Package, you will experience the beauty and challenges of The Oaks Golf Club. Nestled among majestic timberlands and native wetlands, The Oaks provides one of the most unforgettable golfing experiences on the Mississippi Gulf Coast. Tunica National is the South's newest and finest golf facility featuring an exciting 7,210-yard, par 72 championship layout designed by renowned PGA Tour Player and architect Mark McCumber. You'll love the rolling terrain and unspoiled course conditions. Numerous strategically-placed water hazards and bunkers are balanced with a generous landing area which is why Tunica National is perfect for all levels of players.